After her cancer diagnoses, Marie Cajuste’s life unraveled. She was unable to work during the most intense part of her treatment. Something was very wrong. Marie Cajuste couldn’t ignore it any more. She had noticed a hard lump in her left breast about a year before, but kept the discovery to herself. She literally could not afford to be sick. Cajuste sometimes worked back-to-back shifts, stretching from 3 p.m. until 7 a.m., and still barely covered her bills. Her focus was on keeping her three grown children, who had weathered their own disappointments, and two grandchildren under one roof. Illness was not an option. But instead of going away on its own, as she hoped, the mass grew. She finally revealed her secret at a family meeting. Her two daughters were shocked. “You need to see a doctor right away!’’ her son, Jacques Cajuste, insisted. And so at last, on a summer morning before work, she forced herself to board a city bus bound for the Boston Medical Center emergency department. 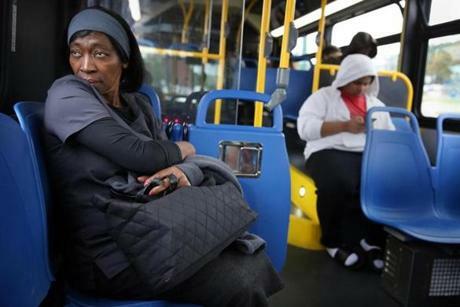 Marie Cajuste rode a city bus from her boarding house in Dorchester to her job in West Roxbury. She moved to the boarding house after losing her apartment because she was unable to pay the rent while being treated for cancer. There, the doctor who examined her was alarmed. She told Cajuste, who had no health insurance, to return the next morning so staff could enroll her in the Medicaid program and perform an emergency mammogram. The bad news came two weeks later, on Sept. 14, 2016. Surgeon Dr. Jane Mendez told Cajuste she had invasive ductal carcinoma,the most common type of breast cancer. The mass was baseball-size, too big to safely remove, Mendez told Cajuste, then 56, and her daughter, Yasheena Bey, during a tearful appointment. Chemotherapy to shrink it was where her treatment journey would start. Where it would end she couldn’t know, but along the way her finances, already precarious, would fall apart entirely. She would lose her home and her family would be scattered. For hers was a common but too-seldom-discussed diagnosis: cancer while poor. Battling potentially mortal illness is a crushing burden for anyone, but especially so for those, like Cajuste, who toil at the vulnerable lower edges of the economy. She would encounter compassionate caregivers, to be sure, but the health care system is simply not set up to lift the burden on people like her. Their hard discussion ended, Mendez sent her patient up to the third floor of the hospital’s Moakley Building to meet oncologist Dr. Naomi Ko. Cajuste, a determined woman with an unbending work ethic, immediately wondered whether stress might have caused or worsened the cancer. That question was hard to answer. The delay in seeking treatment was another thing entirely. Ko typed notes as they talked. “There was a sense of disbelief but also regret for not seeking medical attention earlier,’’ she wrote. “I was actually really scared for her,’’ she recalled. In the following days, Cajuste waited anxiously for results of a scan to see if the stage 3 cancer had spread to her bones or organs. Fortunately, it had not. She began chemotherapy on Sept. 21, first receiving an infusion of two drugs, and then three. A patient “navigator’’ scheduled a hospital van to bring her free-of-charge to and from appointments. Marie Cajuste adjusted her wig after radiation treatment at Boston Medical Center. 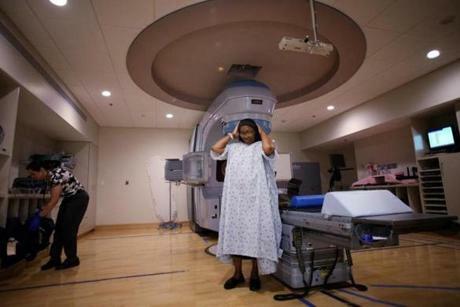 She stood in front of a linear accelerator, used to deliver targeted radiation. But as her long, shiny, black hair fell out, her sense of taste disappeared, and her fingers became numb, a far worse complication emerged: With her immune system weakened, it wasn’t safe for her to work at the nursing home where she had been employed for 16 years. Her paycheck gone, she soon fell behind on her rent — $1,900 a month for a top-floor apartment in a Dorchester triple-decker. Then on Nov. 3 at 9 p.m. her cellphone pinged with a text from her landlord, Ly Nguyen. Cajuste knew what the message would be. Cancer is a tremendous burden on anyone. But for a growing number of lower-income and even middle-class patients, a diagnosis leads to an avalanche of trouble. 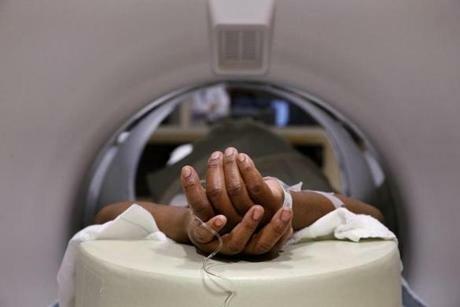 Marie Cajuste lay on a gurney during a PET-CT scan in the Nuclear Medicine and Molecular Imaging department at Boston Medical Center in Boston. Health insurance does not always provide protection — one-third of cancer patients go into debt, most owe more than $10,000 — because their policies do not cover all the treatments and medications they need. Low-wage, hourly workers with little savings and paid time off, however, are especially vulnerable. House cleaners, cashiers, bus drivers, nursing home aides, and many others. Even in Massachusetts, a state that enjoys one of the highest average household incomes and lowest percent of uninsured residents in the country, this scenario plays out repeatedly. Across the city from Boston Medical Center, Dr. Kira Bona studied 100 families whose children were treated for cancer at Dana-Farber Cancer Institute between 2011 and 2013. Over the first six months of chemotherapy, the number of families with unstable housing — meaning they were doubled-up with other families, living in overcrowded conditions,, or had moved multiple times — rose from three to seven, and the number of families without enough food jumped from 11 to 19. However rich in resources, the state still has no comprehensive approach to cancer’s financial toxicity. Doctors often aren’t even aware that a patient is struggling financially. Some charities and foundations provide assistance, but the need is great and they generally offer just one or two rent or mortgage payments. 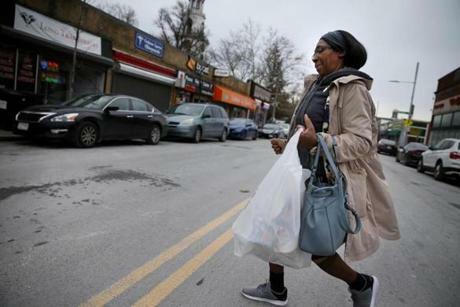 Marie Cajuste hurried across Washington Street while shopping in Codman Square. As for lower-income housing, here is a startling statistic. Metro Housing Boston, which helps lower-income residents pay rent, has 36,000 people on its waiting list for so-called Section 8 vouchers. Those at the top of the list applied in 2007. The group does not offer special status for applicants with major illness. Neither does the Boston Housing Authority, where the wait for a unit can stretch a decade. A gap that Marie Cajuste fell right into. She had emigrated from Haiti to Canada in her 20s, and then moved to Boston several years later when she got married. When her marriage dissolved in 2009, she rented her apartment near the Ashmont train station. She turned the dining room into a third bedroom so she could accommodate Jacques and Yasheena, who was in junior high school at the time. Eventually her middle child, Janice Flowers, and Janice’s own two girls, joined them. The building’s owners originally rented her the apartment for $1,275 because they knew she struggled financially, said Hong Nguyen, Nguyen’s wife, in an interview. But over time, they raised it to $1,900, she said, saying it was because the family requested numerous repairs. The ever-increasing expense required Cajuste to take on double duty a few times a month at the Deutsches Altenheim nursing home in West Roxbury, where she had grown into a model employee. She fed, washed, and dressed residents with exceeding kindness, said Kathleen Colby, whose mother Cajuste cared for. She made sure her water and books were within reach on the night table and that her mother’s television was turned to the Red Sox game. The back-to-back shifts were grueling, but Cajuste was not one to complain. “This is the only way to keep my family together,’’ she told herself. Once before when she fell behind on rent, Nguyen said he might have to evict her, but Jacques helped her catch up with earnings from his job at Pottery Barn. Then came cancer. And the question of work. Ko, the oncologist, recommends that her patients keep their jobs during treatment, if possible, to maintain some normalcy. But the reality is that two-thirds of cancer patients nationally stop working full time after their diagnosis. Work, for Cajuste, was a particular conundrum. At the nursing home, she would be exposed to germs when her own immune system was stifled by chemotherapy drugs. And while a desk job might be OK, a highly physical job like hers, one that required her to be on her feet for extended periods, was not a good idea — especially not when she was in pain and fatigued from treatment. When Cajuste had to move out of her apartment, one of the items she and her family had time to move was her black lacquer framed bed. “I didn’t want anything bad to happen to me,’’ Cajuste said. For the first three months she was out of work, she received short-term disability benefits, but that was only a portion of her regular pay. She had chosen not to buy long-term disability insurance because of the expense. Her paychecks ran out in December 2016. As her income dwindled to nothing, Nguyen’s texts and visits intensified. When he first mentioned the risk of eviction, she texted him back that she was sick and in pain. “I will pay two months with tax money. I am going to have surgery soon. I will be (going) back to work,’’ she promised. Nguyen and her hospital navigator suggested she apply to Metro Housing Boston, a nonprofit that provides tenants who qualify with up to $4,000 in rent assistance. Cajuste called but the agency had run out of funds for the program. Cajuste was embarrassed about her predicament and kept the seriousness of her situation to herself, but as doctors saw her blood pressure rise, she acknowledged to her navigator, Lindsey Streahle, that she was worried about money. Medicaid paid for all of her medical care, but, of course, it didn’t cover dinner or a place to sleep. Yasheena was with her mom at that Dec. 7 meeting. “She has been very independent and wouldn’t ask for help so it was very difficult to ask,’’ Streahle recalls Yasheena explaining. Streahle, whose position is funded by the American Cancer Society, helped Cajuste apply to several charities. But it turned out to be a race against time. The day after Christmas, the court issued an eviction notice. By then, she owed $4,800 in back rent. The Joe Andruzzi Foundation donated $700, a check made out to her landlord. The hospital and another charity gave her grocery store and Target gift cards for food and other necessities. But her debt continued to grow. Cajuste and Nguyen finally decided to see a mediator at Boston Housing Court on Jan. 31. Cajuste agreed to pay her balance — which was completely unrealistic, given her meager means — and leave the apartment by March 31, according to court records. Her landlord agreed to put her $200 security deposit toward back rent. There was better news on the medical front. Cajuste’s new surgeon, Dr. Maureen Kavanah, shared word that the chemotherapy drugs had worked exceedingly well. She was cleared for a mastectomy on Feb. 27. Cajuste said she was grateful. She said nothing about her pending homelessness, not to Kavanah or anyone else at the hospital. 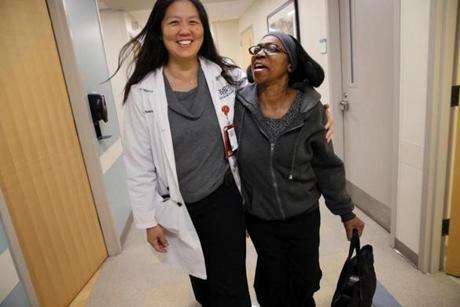 Dr. Naomi Ko walked with Cajuste in October after giving her the good news that a scan had shown her cancer free. Her children knew they had to do something fast. They called their aunt, Cajuste’s sister. Cajuste would stay with her temporarily at her Dorchester apartment. Jacques had already moved in with a girlfriend in Everett. Yasheena made plans to move in with a friend. Janice and her girls would also stay with their aunt for awhile — until Janice moved back to Canada to attend culinary school. Jacques rented a small truck, but he could only move a few things into storage before the deadline. They took their mom’s black lacquer framed bed, her clothes, and a plastic bin of personal documents. They left couches, end tables, dressers, the kitchen set, and a soft-cushioned chair her son had brought her from Pottery Barn. Cajuste would often wonder what happened to it all. Were her possessions thrown out? Sold? But her most vivid lasting memory was of Yasheena, tearful and standing in the living room with a small suitcase. “I didn’t know what was going to happen to her,’’ Cajuste said. After her surgery, Cajuste began her next phase of treatment. The chemotherapy had worked — no cancer cells were found in the remnants of the tumor. Now it was time for radiation therapy five mornings a week. She also faced a new dilemma. It was time to leave her sister’s house. She was sharing a bedroom with her and her clothes were in bins. But where would she go? She returned to work in May, 2017, on the 3 p.m. to 11 p.m. shift. As for housing, Streahle, the hospital navigator, recommended several agencies for affordable housing. Cajuste dutifully filled out the paperwork for several complexes in Dorchester, but the wait could be years. Then one day, as Yasheena was walking in Codman Square, she saw a piece of paper tacked to a utility pole. Room for rent. $900 a month. She called her mom immediately. “Will you stay there? You have to share a kitchen and bathroom,’’ she asked. She moved into the light blue house steps from the Codman Square Health Center last January. Her small bedroom was painted a deep red. Four tenants — two men downstairs and Cajuste and a young mother with a baby upstairs — shared two older bathrooms. The kitchen was not spick-and-span like she preferred, which was disappointing since her favorite pastime was cooking large meals, but it would do. She took four city buses to work, and four buses back home around midnight. It was a trek, but she was happy to have her own space and be in charge of her life again. She was able to work. She had a roof over her head. And based on her most recent tests, she was now cancer free. This was the day Cajuste had been looking forward to for months. She was done with chemotherapy. Radiation was over too. She had had her last dose of Herceptin, the targeted cancer therapy that had been so effective at stopping her disease. The next step — the last step — was today, March 22, 2018. Under the skin on the right side of her chest, surgeons had implanted a small plastic disc with a hole in the middle, from which a tiny tube was threaded into a vein. Her medications were pumped through this port directly into her bloodstream. But she didn’t need the port anymore and today it was scheduled to come out. Then, as she dressed, Cajuste’s fingertips grazed something under her right arm. She couldn’t believe it. It was a lump. She yelled for her daughter, who felt it too. “Mom what is going on? !’’ she asked. “I don’t understand,’’ Cajuste responded. At the hospital, Cajuste showed the lump to a physician assistant in the interventional radiology department. Erica Smith texted Ko, who was checking on patients in the hospital. “Your patient is here to get port removed. She found a mass. Should we still take out the port?” Ko recalls reading. “Oh, God,’’ Ko thought as she called to tell her to absolutely leave it in place. A hospital bus picked up Cajuste and took her to another building for urgent scans and a biopsy. Afterward, she waited for a hospital van to pick up her and her daughter. When it didn’t arrive, Cajuste called Streahle, the navigator, in tears. Cajuste was at her breaking point. “She just wanted to get home,’’ Streahle said later. Ko said she does not know if Cajuste’s financial struggles and stress of eviction contributed to her recurrence — or to her original cancer for that matter. Scott Ramsey, a researcher at the University of Washington in Seattle, has found that cancer patients who filed for bankruptcy had higher mortality rates than cancer patients who had not faced serious financial crisis. But research into this issue is just beginning and doctors don’t understand yet exactly how financial crisis might impact a patient’s health. Cajuste could not help but wonder. There was no answer for her, but she was determined to make her plight a lesson for her children. 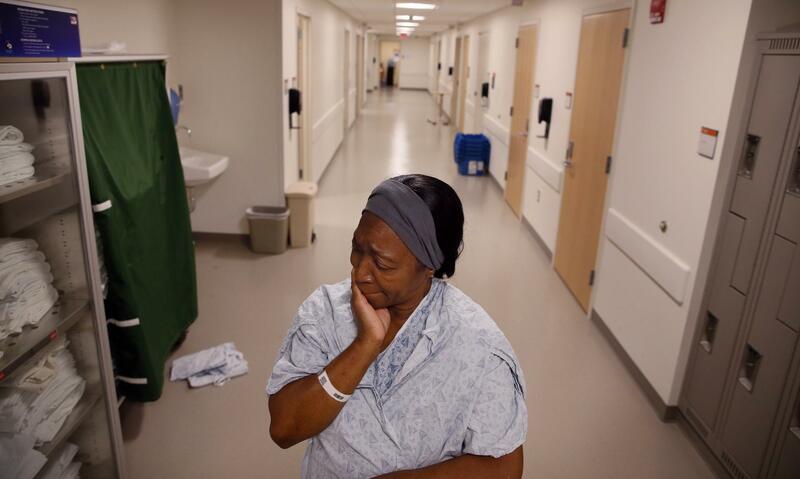 Boston Medical Center, which treats more lower-income patients than any other hospital in the city, has many patients like Cajuste, or in even worse situations. About 20 percent of patients admitted there are homeless or at risk of becoming homeless. Sandel and colleagues interviewed thousands of families in primary care clinics and emergency rooms in Boston and four other cities and found that more than one-quarter had been behind on rent. Eight percent had moved multiple times, and 12 percent had a history of homelessness, according to the study published in the journal Pediatrics in January. Yet, it can’t be up to doctors to solve these problems on top of providing medical care. Especially when most patients don’t volunteer their personal problems. Cajuste finally told Ko she had lost her home — and felt relieved to have shared that burden. It is the plight of patients like Cajuste that convinced the hospital to invest $6.5 million in housing initiatives. And to establish a partnership with the Boston Housing Authority, which has set aside 75 public housing units for Boston Medical Center patients who urgently need a place to live. When those units become available, a patient goes to the top of the wait list. BMC has placed 18 families so far. The hope is to improve patients’ health. When Kavanah removed the tumor from under Cajuste’s right arm, she discovered the same thing she had when she removed the first tumor in her breast: The cancer was gone. The chemotherapy had done its job extremely well. But the recurrence changed the picture entirely. On July 11, Cajuste sat in a reclining chair in the hospital’s infusion unit, a white blanket covering her lap, waiting for her longtime nurse, Toni Duff, to start her infusion of Herceptin. Ko walked in and pulled up a small black stool next to Cajuste. She took her hand. Even though doctors had successfully treated the recurrence, it meant the cancer had the potential to return fast. Ko told Cajuste she would need to be on Herceptin every three weeks indefinitely. Maybe forever. Since the main side effect of the drug is heart damage, Cajuste would need echocardiograms every four months. “It’s going to require a lot of visits,’’ she said. As summer rolled into fall, Cajuste was feeling more like herself than she had in a long time. 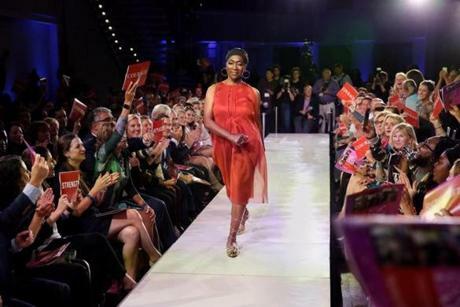 One proof of that is that she said yes when the hospital invited her to be a model in its annual cancer center fund-raiser — the so-called catwalk that featured cancer patients, doctors, and professional models wearing designer clothing. The event raises thousands of dollars to pay for patients’ non-medical costs, such as transportation, wigs and yoga classes. On the 33rd floor of a State Street skyscraper in downtown Boston, the hanging lights wrapped in crystals were dim. Women and men drank wine and changed into their outfits behind a huge black screen. It was elegant and chaotic. Cajuste wore long, fake eyelashes, and a black dress with tiny pink flowers her son had recently bought for her at Marshall’s. An event photographer snapped a picture of them, with Jacques resting his head on her shoulder. As the 8:30 pm fashion show drew near, Cajuste changed into her designer outfit — a clay-colored sheath dress with a gauzy overlay, large gold hoop earrings, and flat gold shoes with tie up laces. When it was her turn, she strode proudly onto the stage to the beat of the music. Yasheena and Jacques and the rest of the crowd erupted into cheers. She smiled and raised her arms into the air. Marie Cajuste modeled a dress designed by Nubia Williams during the fund-raiser. Cajuste and her children attended a boisterous hospital cocktail party afterward. Jacques said he was speechless at seeing his mother on the catwalk. “She looked so confident,’’ he said. Four days later, Cajuste returned to Boston Medical Center for a scan to check for cancer cells that might have spread to other areas of her body. It was a difficult, stressful morning and Cajuste yelped in distress when radiology staff pumped hot-feeling contrast dye into her veins, which would help doctors spot any cancer. On Oct. 17, a beaming Ko met with Cajuste in her office. Her scan was clear. Completely clear. “Thank you, thank you, thanks a million,’’ Cajuste said, clasping her hands in prayer. A few hours later, Cajuste returned to her rooming house, where a shooting would occur in front of her house just days later. But her constant fatigue has lifted, she is cooking again, and her daughter was able to rent a room there, too. She has also moved up on the waiting list for an apartment in Dorchester through a federal program that aims to keep rents affordable for lower-income residents. According to the latest update, it could be hers in less than a year. Home again, at last. Correction: Because of a reporting error, the title of physician assistant Erica Smith was incorrect in an earlier version of this story. The Globe regrets the error.